John Will Parks IV, D.M.A. I have the greatest job in the world. I work with the best students on the planet in one of the most amazing and high-ranking educational and performance environments anywhere. I love what I do, and have been very lucky to perform all over Europe, the Far East, and the United States, with venues include Carnegie Hall, Tokyo Opera City, The National Concert Hall of Taipei, Taiwan, Mahidol Performing Arts Center/Bangkok, University Concert Halls, and International and National Trade and Music Education Conventions. You can hear me on over fifteen CDs, recently including the Oliverio Double Timpani Concerto with Scott Herring and Scott Weiss and the USC Wind Ensemble on Summit Records, the Eastman Wind Ensemble at 50, recorded live on the 2000 tour of Japan and Taiwan on Warner Brothers, and Dusk: Percussion Music from the Heartland, which includes the premiere recording of Blake Tyson's "Vertical River." I've engineered projects for Rattle Records, Calabaza, Equilibrium, Flying Horse, and my own company, Garnet House Productions. In 2014 I was admitted to the National Academy of Recording Arts and Sciences as a voting member for the GRAMMY Awards. As an educator I've given master classes and clinics all over the place, including the Basilica Festival in Belgium, Thailand Brass and Percussion Festival (Bangkok), the Midwest International Band and Orchestra Clinic, Percussive Arts Society International Conventions (12 appearances), state MENC conventions, PAS Days of Percussion, and leading conservatory, university, and high school programs across the country. 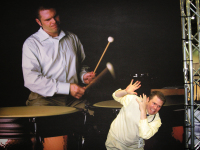 ​During the school year I teach at FSU and perform as a utility percussionist, and for several years served on the faculty of the Eastern Music Festival in Greensboro, North Carolina. During the summers I work mostly for Garnet House, but have given summer classes at Interlochen, the Leigh Howard Stevens Seminar in New Jersey, and the Oklahoma Summer Arts Institute. I hold degrees from some of the finest music schools in the world: The Eastman School of Music (Doctor of Musical Arts in Percussion Performance and Literature), Northwestern University (two Master's degrees in Performance and Jazz Pedagogy), and Furman University (Bachelor's degree in Music Education). My teaching career began at Samford University (1995-1998), then the University of Kansas (2000-2003), and I've been at Florida State since 2003. Thank you so much for stopping by my website! You can find out all kinds of things about me, the Florida State University Percussion Studio, and Garnet House Productions while you're here, so enjoy and feel free to visit my other pages by clicking on the icons below. 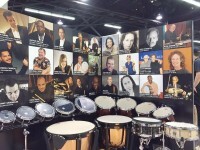 I am thrilled to work with the best instrument and implement companies in the percussion world as an artist/endorser. You can find more information by clicking on the images below for Malletech, Black Swamp Percussion, Avedis Zildjian Cymbals, and Remo Drumheads. 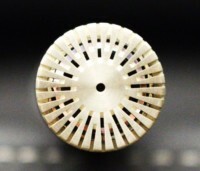 FSU is fortunate to own a ludicrous amount of high-end instruments, including six sets of Dresden timpani (four sets of Walter Light Mark XI, two Adams Classic Dresdens), seven 5.0 marimbas (Malletech, Adams, and Marimba One), Adams and Deagan xylophones, Deagan, Adams, and Fall Creek glockenspiels, Malletech (Omega), Yamaha and Adams vibraphones, bass drums, chimes, and a storage facility filled with scores of drums, hardware, and toys. Our inventory allows all practice rooms, rehearsal spaces and our five concert halls to have all the necessary equipment to make any rehearsal or performance a great experience. 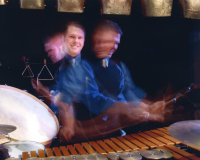 FSU is the only percussion program in the country to utilize audio/video technology at the professional level. We have a selection of microphones including DPA 4006-TL omnis, sE4400a and AKG C3000 LDCs, interfaces from Presonus (192) and Focusrite, Genelec 8040a nearfields, two Canon XF-200 camcorders and a host of cables, stands, light kits, backdrops, and software applications including Samplitude X2 Suite, Audio Ease Altiverb 7, Adobe Audition CC, After Effects CC, Lightroom CC, Photoshop CC, and Magix Vegas 15 to make sure that our projects look as good as they sound. Every student lesson is professionally recorded, as are last runs of percussion ensemble rehearsals and project recordings of student solo and chamber works for social media distribution, prescreening recordings, and scholarship consideration. Additionally I teach an Introduction to Percussion Recording DIS (directed independent study) in Spring semesters. This course has fostered student growth in technology literacy that has changed the landscape of our program and opened numerous entrepreneurship opportunities for our students. I was inducted into the Engineering Wing of the National Academy of Recording Arts and Sciences in 2014, which allows me to nominate and vote on the annual GRAMMY Awards. This came largely as a recognition of our work at FSU as well as the output of my media company, Garnet House Productions. Please feel free to contact me anytime by filling out the form below. I look forward to hearing from you, and thank you for stopping by the site! © 2018 John Will Parks IV, D.M.A.